A parishioner took some photos of St. Boniface Church for Easter, I thought you might like to see them. 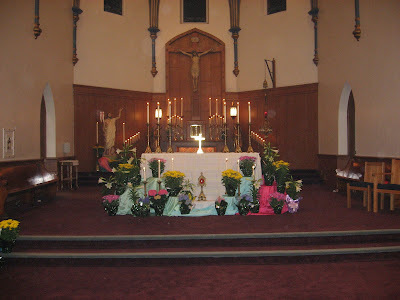 Here is the sanctuary and altar, with lots of candles. The Easter Candle is by the pulpit, out of view. The cross on the altar is bright gold, so it caught the reflection of the camera flash here. The celebrant's chair is actually turned slightly more toward the nave than usual, in order to accommodate chairs put out for the concelebrants. Here is yours truly, badly needing a hair cut, which I didn't have time to get before Easter, but I did shortly thereafter. Father, is that a cassock I see sneaking out below those vestments? It looks great. But I do have one question and one comment. 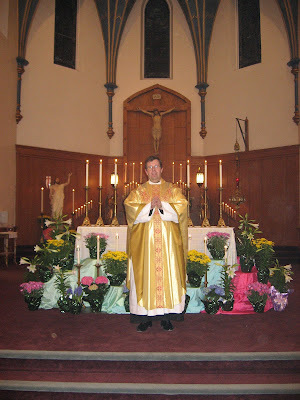 First, what is the relic in front of the Altar? Now for the comment. I have found that having flowers and other stuff in front of the altar can sometimes be a distraction for what is happening on the altar. Also, putting things in front of the altar can prevent people from thinking that Ad Orientem Masses are within the realm of possiblility. This is why in my Parish we never put anything in front of the altar so that at any time Mass could be celebrated from either side of the Altar. Ah, thank you for visiting and your helpful input. I do wonder about having things in front, and if so, just how. The relic is of our patron, St. Boniface. There is no relic in the altar itself, so this seems a way to be faithful to the tradition of having a relic "under" the altar. ...I might add, one of the things I do on All Saints is to bring out all the relics of saints the parish has, and display them at the foot of the altar, and then incense them at the beginning of Mass. I love what you are doing with the relics. The altar at my parish doesn't have any relics in the altar either, and we don't have a relic of our Patroness, St. Rose of Lima. If I did, it would find a place under the Altar.